Of course we all know how easy it is to accumulate tension. On the one hand we have psychological and emotional sources of tension, generally understood under the banner of ‘stress’, on the other hand we have postural stress. The psychological/emotional level causes us to contract, tighten or brace in response to external or internal stressors . It is harder to notice the more basic form of stress which is postural – we hold our body in positions where joints and muscles are under low intensity physical stress for long periods of time, such as sitting for many hours working on a computer or watching TV. 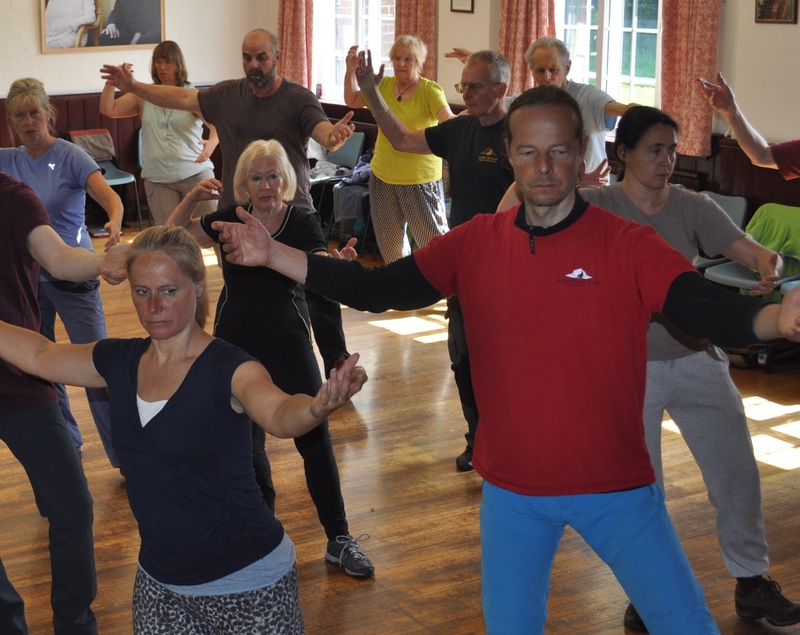 In our practice of Tai Chi we start by developing greater body awareness and we expand our ability to feel a whole lot more of the detail of our physical experience. This is the first level of our Qi work. With greater awareness we notice the source of our physical discomfort which was previously hidden for example leg pain may emanate from the lower back and knee pain from the hip. We may also find that there are whole areas of our body which hardly move and feel difficult to move. Tension can build up in such a way that parts of your body are locked into immobility. This tension manifests in muscles, tendons, ligaments and joints and for many people relates to the upper spine/neck/shoulder area or the lower back/hip/pelvis area. We use our body awareness as the basis of the ‘releasing tension’ method. To describe how to release tension in one word its … movement. Our first movement practice is shaking! In every class we start with ‘Shaking and Breathing’ to music. This is the first, and perhaps most effective, tension releasing method in our school. It was developed by my teacher, Master San Gee Tam, inspired by his own direct interaction with Osho and his dynamic meditations. But shaking is only the start and as you practice more you find that almost everything we do in Tai Chi is a tension release method. Tai Chi movement uses the principle of dynamic stretching which means that the focus is on the movement and the stretch happens in the process of these movements. We use the Tai Chi frame (a very specific body structure) and we move with twists, turns and circular motions of the body/joints. We do all our dynamic stretching gently so at first you may not even notice that your body is getting stretched but over time this reliably releases tension and generates body relaxation. A common mistake is for people to unconsciously fight their tension. This causes them to try too hard, so they approach their release with the thought of ‘breaking through’ tension and end up using too much force and making more tension. Our mind works like this and its counter intuitive to use less effort. The idea we want to develop is to use movement to melt tension – like ice to water. As we progress we may become aware of a deeper kind of tension. We may notice we have knots and constriction inside our body such as a tightness inside the chest, a ball of tension around the solar plexus or ‘gut-wrenching’ feeling in the belly. Working with these deeper tensions is a slower process as they have typically built up over long periods of time and relate to deep rooted personal issues. Over time we learn to feel deep into the knots and use the subtle movement of breath/Qi to release little by little. Its sensitive work learning to feel into our deeper pain and slowly integrate it, we approach this with patience and gradualness so we avoid getting overwhelmed by the release of too much deep tension. We keep progressing and growing as we let go of more and more tension and at some point we can work with our teacher to become more aware of beliefs that are buried deep in our mind that are the ultimate source of the tension we experience with our self and with life. Note that we don’t tend to address this until later on the the Tai Chi process – as our awareness has to get alot more more stable to allow us direct insight into our own mind. If you attend a Tai Chi (or Qi-Gong) class you’ll probably have experienced that the teacher keeps repeating ….relax, relax, relax. Part of learning to relax is this process of releasing tension.